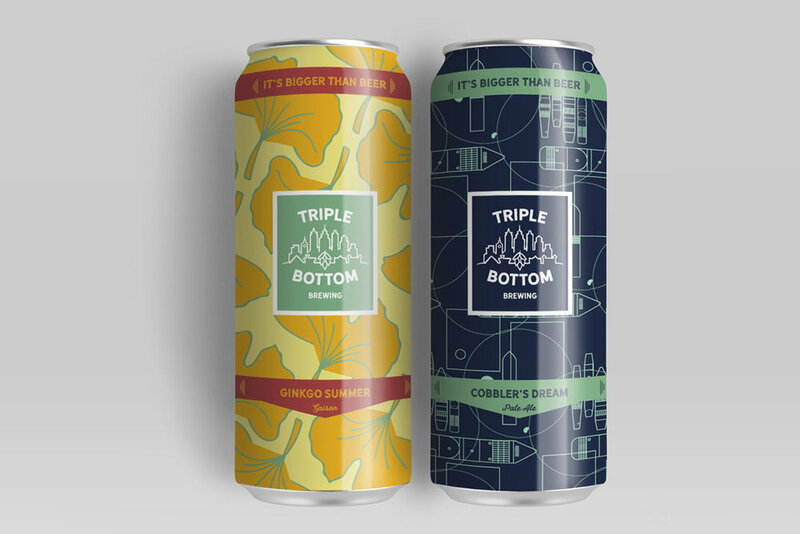 Triple Bottom Brewing is a Philadelphia based brewery. I worked on the company’s logo, overall visual identity and packaging for their beer cans. Triple Bottom Brewing has a triple bottom line: beer, people, and planet. The founders of the brewery, Tess Hart and Bill Powell wanted to create a space that would welcome and invest in its community. They had a clear vision of a logo that would reflect Philadelphia and a wide range of warm and inviting colors. Triple Bottom Brewing is not just about giving back. It’s also about building, investing and growing a community. In today’s saturated craft brewery scene, everyone wants to stand out–which is why Triple Bottom’s slogan is such a bold statement. I wanted to give the slogan enough ground and space to be heard. I created somewhat of a casing/speech bubble that could hold a comment, quote, a review for future statements. Tess and Bill want all aspects of their beer to reflect Philly, whether it’s literal or abstract. We decided to create patterns of things that reminded them and their neighbors of Philadelphia. Some of those things are the circles and squares that are laid out throughout Philadelphia’s grid, the navy shipyard, the windows that house the brewery and ginkgo trees.